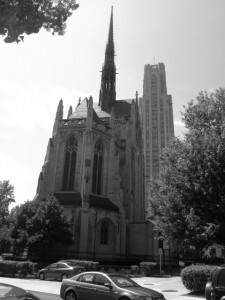 Our Pittsburgh string trio played at the wedding a few weeks ago at this chapel. I hope I don’t have such negative experience again. As a leader of my group I showed up early to set up. Apparently, I was way too early – the bride had indicated incorrect times on our contract. The sad part was how the staff treated me at the chapel. It was a hot, humid day. I have already had a hard time finding parking in Oakland. I showed up on the steps of the chapel with my viola, music stand, my purse, and a fairly heavy bag with music binders for the rest of the musicians. Once I found out that I was early (there was another wedding in progress), I asked if I can use the restroom and leave my belongings there for a minute. Guess what? The answer was no. The wedding coordinator was rude, curt and had an attitude, pretty much telling me to leave immediately, ignoring my questions. She saw all my bags, and yet told me to use the restroom in the building that was far from the chapel, seeing that I have all the “luggage” with me. Ignorant? Yes. Inconsiderate? Yes.